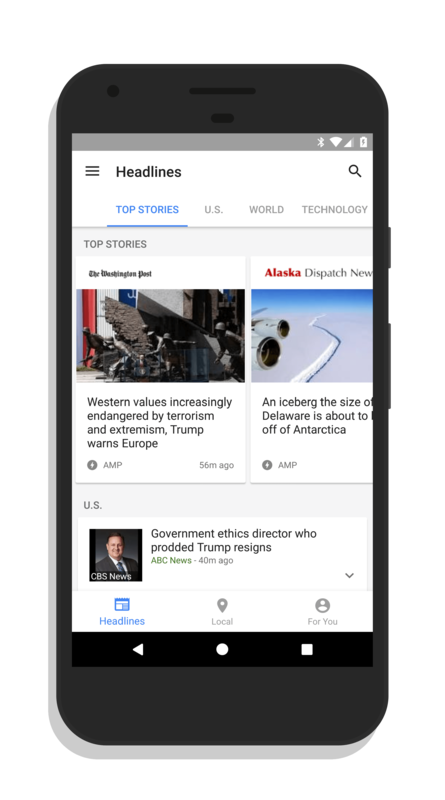 The Google News & Weather app for Android has an update rolling out that brings some tweaks to the overall layout of the app as well as a new, bottom tab style navigation. The update is version 3.3.1 for those keeping score at home and it is in the Play Store now. For those who have it installed, expect to see the OTA update over the course of the next few days. The overall layout of the app has subtile changes and brings the app a bit more inline with the web version of the service that was updated a couple of weeks ago. You still have the top carousel that allows you to select topics of interest and the articles presented are heavily dependent upon AMP for quick opening. The bottom navigation has changed however in Google News & Weather significantly – as in, it’s there now. to view headlines & news. The Local tab gives you local news and weather. This separation of such information from the general news makes it much easier to find news in your location instead of having to swipe to find it in the main headlines of the previous version. Finally, there is the For You tab. This tab gives you articles that are based on interests you have indicated in the app or on articles that you have read. Think of it as the app bubbling up “you may be interested in…” type news but they have put it on a separate tab so you don’t have to wade through it if you don’t want to do so. Overall this is a solid update to Google News & Weather. If you haven’t tried it out, it’s free in the Play Store.